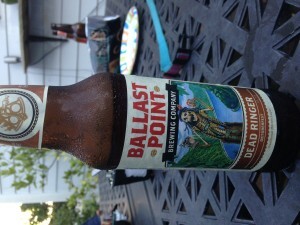 Ballast Point brewing company from San Diego, Ca gives us “Dead Ringer”. It has a 6% alc content but is more on the expensive side. It’s not bad, not the first Oktoberfest beer I would pick. Jennifer says its “too earthy, tastes like dishwater”. She gives it a 2, I am leaning more towards a 3 at best. Your choice.